It’s like they’re staring right at you. That cozy sweater you swore you’d wear everywhere, but it falls weird on your hips and you haven’t put it on for over a year. I DESERVE TO BE LOVED, it laments. That dainty summer top that was fun to wear on a few beach days but constantly falls off your shoulder and is threatening to Justin Timberlake Superbowl XXXVII you. I’M TOO CUTE TO JUST HANG HERE, it cries. Even those beloved hiking socks with holes at every corner plead, THERE IS STILL LIFE IN ME! In pursuit of a more conscious closet, removing unused or worn out items from your wardrobe can help you realize what you feel great in, that you don’t actually need as many clothes as you think, and provide that breath of fresh air de-cluttering our wardrobes gives us. 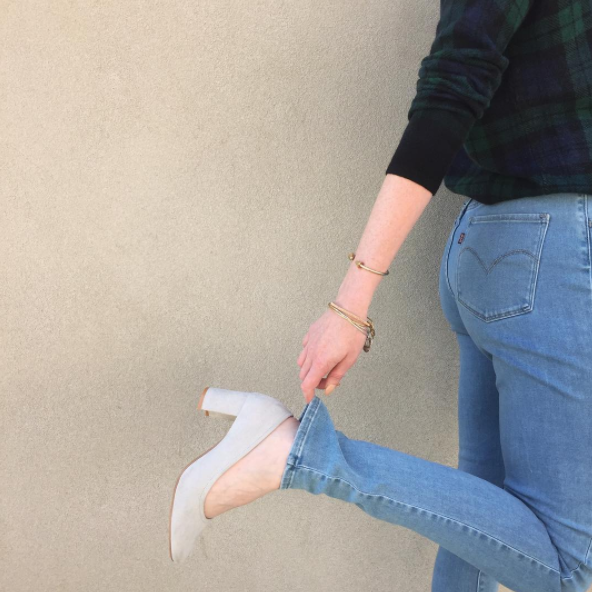 Once we’ve slimmed down our wardrobes we've found ourselves asking, "Where do I take my used clothing?" Finding the right place for these unwanted items to be reused or properly recycled is an important step in pursuing ethical fashion! Check out our article Recycle Your Clothes - Save the World for more information on why you should recycle clothing in ANY condition. Below, we’ve listed the many options for making sure your clothes don't simply end up in a landfill, from your most precious pieces to the ones that are barely holding themselves together. Consignment stores are the treasure chests of second hand clothing. Choose a store, bring your lightly loved pieces and have them re-sold for cash or store credit in return! Different stores have different policies about what they take and what percent of the sale price they return to the consigner. The consigner must also be seasonally-minded, as the store is not likely to take your short shorts in November. The Clothing Bar - a pretty much perfect mix of brands and price ranges for women’s clothing. We love that they donate what doesn’t sell in store to WINS, support local makers, host regular community events and have significant seasonal sales. Velour Clothing Exchange - a one stop shop for wearable vintage at wonderfully reasonable prices for men and women. Take your vintage clothing (1990’s and earlier) as well as newer vintage-style clothing here! Velour also supports local artists in store, selling locally made patches and pins and hosts pop ups for local businesses. Learn how to shop vintage like a pro here. Fond Boutique - an exquisitely curated selection of high end items. A boutique you can trust with your most precious items. Peacock Boutique - a high traffic store that often results in a high return to the consigner. Peacock boasts a unique selection and often stocks coveted items. Their Instagram and online shop are great resources to see what’s new in store each week! Expressions - a well stocked shop with new items each day. Expressions is a stellar place to search for designer items at a fraction of the cost. This is one of our favourite spots to shop for second hand denim. Man of Distinction - a man’s second hand dream land. From dressing up for a special event to a day on the soccer field, Man of Distinction has a wide range of clothing for men and children. If you’ve got some time on your hands, a clothing swap can be a fantastic way to get your friends involved in becoming more conscious about their closets, while renewing your wardrobe with free clothes. Check out our First and Second clothing swaps for tips on how to host your own. There are plenty of places to choose from when you want to simply donate your clothes. Our preferred places to donate our clothing and textiles are the establishments that donate their proceeds to a good cause. Pick a cause close to your heart and donate your used clothing to support their programming! Women in Need Society (WINS) - WINS uses all proceeds from its thrift stores to support women in poverty in Calgary and their families with their Free Goods Program and Family Resource Centres. WINS has 5 locations across Calgary (where you can also shop). WINS will also pick up your clothing and furniture for free! Making Changes - Through their “Walk In Closet” program, Making Changes provides free 90-minute consultations on professional business attire and business culture while offering gently used business clothing for unemployed and underemployed women with financial barriers. Making Changes also provides clothing for teenage girls to meet their school and recreational needs. The Calgary Pregnancy Care Centre (CPCC) - CPCC accepts gently used maternity and baby clothes for women facing an unexpected or crisis pregnancy or for women who have limited ability to buy clothing for themselves and their new family member. Cerebral Palsy Association in Alberta (CPAA) - CPAA will pick up your used clothing and household items and sell them to Value Village with all proceeds supporting their Community Education, Sport & Leisure and Support programs. Diabetes Canada - Diabetes Canada will pick up your clothing, household items and textiles and sell them to Value Village, using the profits to support diabetes research, education, services and advocacy. The Drop In Centre (The DI) - The DI accepts gently used clothing donations for their Free Clothing Store to offer to the men and women at the DI who have limited resources, providing them with the basic dignity and right of appropriate clothing. Goodwill - Goodwill uses proceeds from its thrift stores to support Albertans with disabilities in finding work or hiring Albertans with mental health challenges at their Commercial Services Division. The organization values the environment and has committed to responsibly recycling all goods they can not sell. Goodwill has locations across Alberta. Inclusion Alberta - Inclusion Alberta accepts donations of clothing, accessories, linens and housewares which are sold to Value Village to raise funds for Albertans with developmental disabilities who need support and advocacy in living in a home of their own, receiving a quality education and finding a job. Value Village - Value Village is a for-profit organization that accepts donations and also purchases clothing from nonprofits to resell or recycle. Value Village has locations across Canada. Almost all textiles can be recycled one way or another! Read Recycle Your Clothes - Save the World to find out why recycling your textiles is a crucial aspect of sustainable fashion. There are several options for your clothing or household items that are too far gone to be re-sold. Clothing for a Cause - Clothing for a Cause has placed large blue bins throughout Alberta to receive all textiles for re-sale to international clothing recyclers. The proceeds currently support Haiti Arise Ministries. The Drop In Centre Cloth Recycling - The DI re-sells old and worn out textiles to local fabric recyclers. On a side note, they also accept perishable food items that would otherwise go to waste in your home. Calgary Throw and Go - At the City of Calgary landfills there are “Throw n Go” areas to drop off clothes, shoes, textiles, etc. in any condition. This service was created to divert the estimated 100,000 tonnes of unwanted clothing sent to the Calgary landfill each year for re-sale to international retailers or textile recyclers. All of these drop offs are organized by the aforementioned Clothing for a Cause. More information can be found in this helpful article by the Calgary Journal. 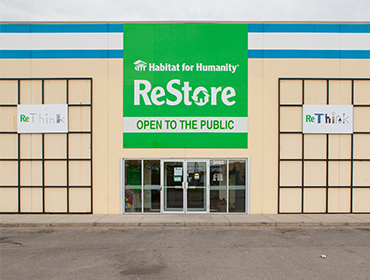 ReStore - If you have any unwanted household items, including clothing you think could still be used by someone else, ReStore by Habitat for Humanity will accept or pick up these items. All proceeds from their re-sale support Habitat for Humanity. David Suzuki’s website provides an extensive list of how to recycle your unwanted “stuff” across Canada. If you read through the above list, you might be surprised to learn that much of our donated items end up being sold to international clothing recyclers. According to a 2007 article from Environmental Health Perspectives, only one fifth of our donated clothing is directly sold in thrift stores as there is "nowhere near enough people...to absorb the mountains of castoffs, even when given away." According to the EPA Office of Solid Waste, more than 68 pounds of clothing and textiles is thrown away per year per person in America. On top of this, creating clothing textiles like cotton and polyester have a tremendous impact on the environment. The images in this short documentary about the re-sale of clothing to international recyclers are eye opening. An essential aspect of being a more responsible global citizen is buying less. The resources needed to create, sell and recycle or decompose clothing are astounding. Simply buying less is a crucial step in a more earth and people friendly lifestyle. Our interpretation of the Buyerarchy of needs helps us when making a decision to add a piece to our wardrobe.